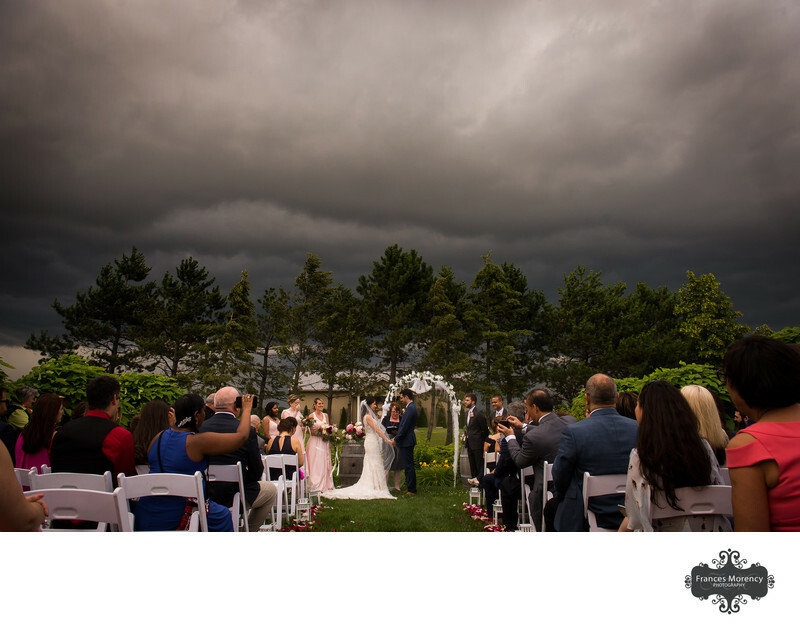 The storms were on the way during this outdoor wedding ceremony at Rockway Vineyards, but this bride and groom did not let it phase them. They had all their portraits scheduled before the ceremony and the ceremony ended up with dramatic skies but no rain. The rain started right after family photos and perfectly timed during the reception. Rockway Vineyards in Jordan is on a golf course, but they have the most beautiful location for photography and outdoor ceremony. A beautiful long laneway, many out buildings such as this one, a pond with fountain and beautiful gardens and vineyard. When you have a windy day a vein makes all the difference in your photos and I'll take a dramatic dark sky any day. We started the day at an Inn for bridal preparations before heading to Rockway Vineyards for the ceremony and reception. The weather was threatening a thunderstorm. Rockway Vineyard had many local hotels for the bride and groom to get ready and within easy distance to the wedding venue here in the Niagara region. The Vineyards at Rockway as an ideal location for portraits. 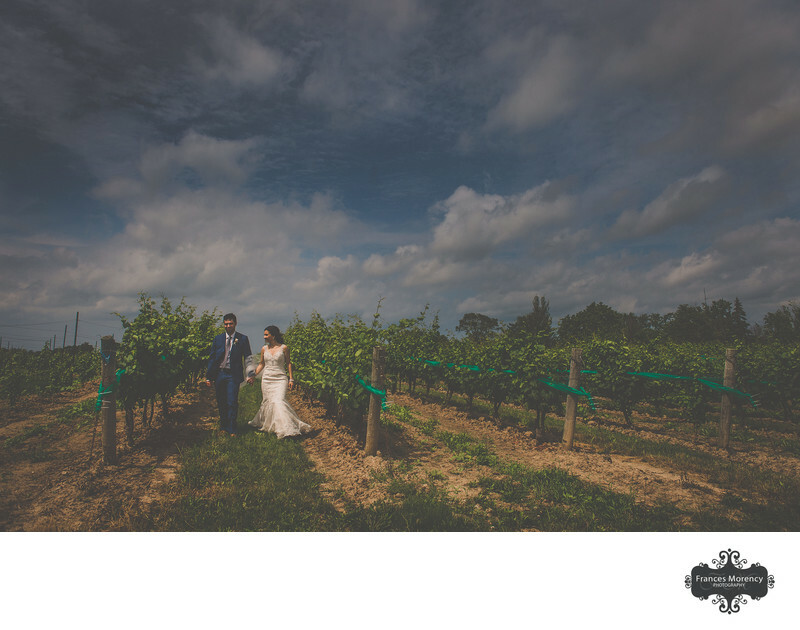 The skies are dramatic on this day and a simple walk through the vineyard created some beautiful portraits for this couple on their wedding day. 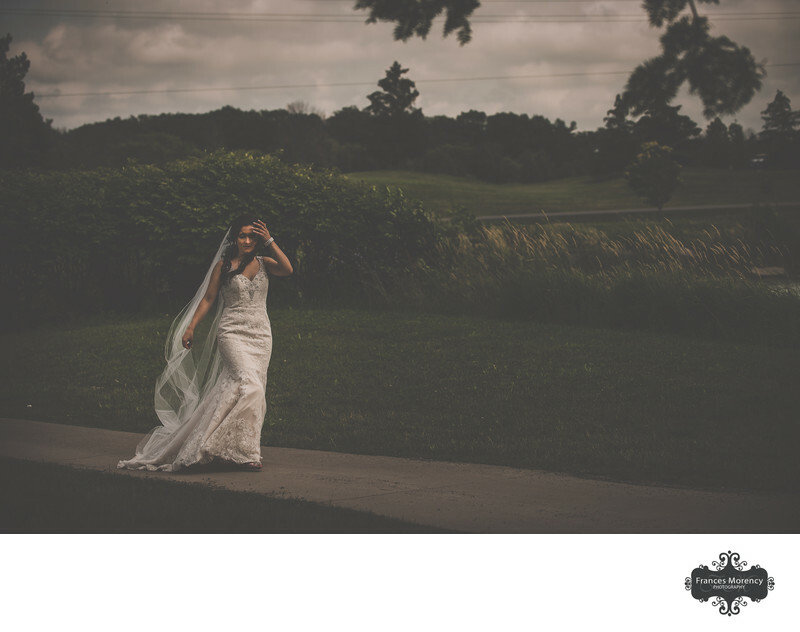 A wedding day with a breeze and a veil will always be one of my favourite things because a bride and groom are most natural when they are walking or playing with the veil and adjusting the gown. This path along the golf course is right along a beautiful pond with fountain. The storm blew in rather quickly and the staff knew that it was going to start raining in about 30 min. We had just enough time for the ceremony and family photos before the rain came down and then just as fast the clouds parted and the sun came out. Location: Rockway Vineyards 3290 Ninth St, St. Catharines, ON L2R 6P7. Keywords: Documentary (36), Journalistic (51), Winery (12). 1/2500; f/5.6; ISO 500; 32.0 mm.